This delicate mousse, with its buttery crumb crust, is perfect for family gatherings. Add boiling water to gelatin mixes; stir 2 min. until completely dissolved. Pour into blender. Add sour cream; blend until smooth. Pour into large bowl. Refrigerate 15 min. or until cooled. Meanwhile, mix cracker crumbs, sugar and butter; press onto bottom of 13x9-inch pan. Whisk 2 cups COOL WHIP into gelatin mixture until blended; spread over crust. Top with fruit. Refrigerate 30 min. or until firm. 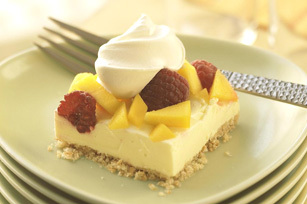 Enjoy this refreshing dessert year round! Just prepare as directed, mixing and matching your favorite flavors of JELL-O with your choice of seasonal fresh fruits. Prepare as directed, substituting 2 ready-to-use graham cracker crumb crusts (6 oz. each) for the homemade crumb crust and dividing the filling between the crusts. Top with fruit and continue as directed. Cover with plastic lids from the pie crusts for storage and easy toting to your destination. Cut each mango in half, just clearing the long flat seed. Score the flesh into squares of desired size, being careful to cut up to, but not through, the skin. Then cut squares from skin.